Our fresh harvest of walnuts are cleaned, laser sorted, and processed through our walnut shelling station for a final ready-to-use product. 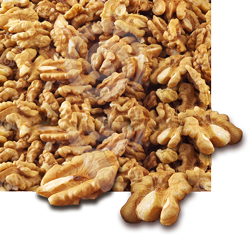 Gambini Walnuts are packaged in sturdy convenient 4# | 10# | 25# | 30# cases. Large orders are palletized and made ready to ship per your instructions. Call Us Today to Discuss your SHELLED Walnut Needs!